that I without a scratch climbed from the vale of bones. At times I can’t imagine it, it’s past belief. and out of the hot ashes I arose newborn. 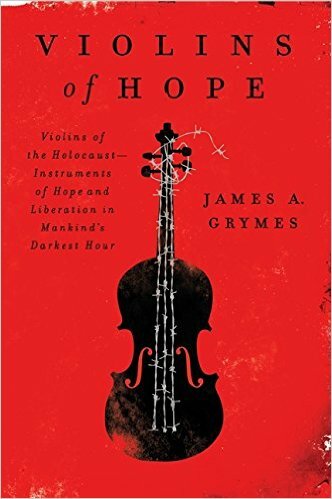 Tracing the stories of violins played by Jews in the Holocaust, author James Grymes allows the story of each instrument to be a voice and a memorial for the souls of those who played them. These stories raise out of the hot ashes of brutality, unimaginable horrors, and a time of incredible darkness – speaking for those who cannot speak. Juxtaposing these stories, James Grymes shares the story of Amnon Weinstein whose father Moshe opened a violin shop in Tel Aviv in 1938. After the war, Moshe learned of the death of 400 family members. The pain of that discovery lead to Moshe’s first heart attack and he never again spoke to Amnon of his family. On January 19, 1945, after the survivors of Auschwitz III had been taken on a two-day death march to the Auschwitz subcamp of Gleiwitz, Wiesel found himself on top of Juliek in a packed barrack. Later that night, Juliek extricated himself from the pile of living and dead bodies long enough to play a Beethoven concerto on the instrument he had brought with him from Auschwitz III. When Wiesel woke the next morning, he saw Juliek’s lifeless face staring back at him. Next to Juliek was his crushed violin – a fitting symbol of the hundreds of thousands of Jewish lives that had been destroyed in Auschwitz. Painfully raw, Violins of Hope is a testimony to the strength, perseverance, and hope of the Jewish people. It is a book that haunts the reader long after one has read the last page. Thank you, Cindy. We will definitely watch the documentary and I’ll look at the book now. Our son is a violinist in a family of musicians, so along with our Hebrew roots, this is of personal interest. We so appreciate your keeping us informed. Also, might you suggest a collection of Jewish music? instrumental or otherwise? We have some, but very limited. Denisse you are very welcome! My daughter is a musician also. She has a piano performance degree but she has also played the violin for years – so this was of special interest to me too. A number of years ago I read a book you might enjoy – My Heart Is A Violin by Emily Cavins. It’s the story of the Holocaust survivor and violinist – Shony Alex Braun. I’m hoping to watch soon the ‘Orchestra of Exiles’ a movie that tells the story of violinist Bronislaw Huberman who saved about 1000 Jews and formed the Israel Philharmonic Orchestra. Just off the top of my head I do have some favorite artists – Shlomo Katz, Yossi Azulay, Etti Ankri (specifically the album Yehuda Halevy sung by Etti Ankri), Ari Goldwag, of course Itzhak Perlman no matter what music he is playing. Have you ever listened to Daniel Ahaviel? He is an Israeli Hasidic violinist and watching him play and dance at the same time is a joy. There is a beautiful collection of songs (various artists) and reflections (by Rabbi Sacks) on Rosh Hashanah and Yom Kippur that is a favorite of mine called Music For The Jewish Soul. Please share some of your favorites with us! Hi Denisse, Good to see your comment here. 🙂 Would just like to add to Cindy’s great recommendations re Jewish music. Two albums I think you would enjoy are by Eitan Katz (Shlomo Katz’s brother – also a good musician!) “Boruch Hu” (Blessed be He) and “Le’Maancha” (For Your Sake). They are available in the States. Also, “Songs of our Fathers” by Andy Statman and David Grisman. I love Yossi Azulai’s two albums, “Tefilot” (Prayers) 1 & 2. Blessings to you and Steve. Hi Condy, thank you for putting this on. I did watch the documentary, so very moving, feelings that run very deep. A lot of the items that are on the site are beyond my academic ability but this I could so easily connect with. You are so welcome! I am stretched every day in my studies ~ but Ken it is such a blessing to hear that you connected here. If you ever have any questions Keren (or I) are happy to try our best to answer them. Thank you and our Abba’s blessings to you also.